Buy direct from the manufacturer and save! 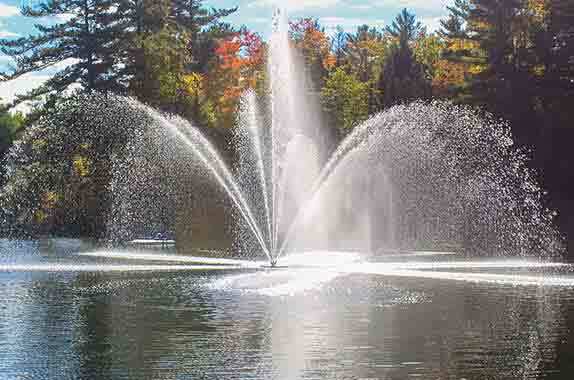 Arbrux Manufacturing is the leading manufacturer of Floating Lake Fountains, Pond Aerators, and Lake Deicers and Lake Bubblers. Arbrux products are quality engineered, using stainless steel submersible motors, fountain impeller pumps and tough / durable propeller deicer, aerator pumps – the result is a low maintenance, long-lasting Lake Fountain, Pond Aerator, and marine Deicer / Bubbler. We make ponds & lakes healthy and beautiful, and protect marine assets from ice damage. Our quality engineered products are designed for Municipal, Industrial, Commercial, Golf and Residential property owners. Arbrux Sets The Standard – Since 1979 Arbrux has set the industry standard for the quality and price for floating fountains, aerators and deicers. Shipped world-wide! Quality engineered products, built to last, using stainless steel components. Simple-to-install, easy to operate and virtually maintenance free. Electrically safety tested and listed with ETL to CSA and UL Standards.